Afraid of missing out on the latest photo industry news while you’re out, well, actually taking pictures? Photography News of the Week is all the news you might have missed this week, published on the weekends. Alongside the biggest stories of the week, like the GoPro HERO7, the new Canon PowerShot SX70 HS, and the Sony 24mm f/1.4 G Master lens, find briefs on the latest in accessories and photography news from this week. Sure, rain can ruin your gear, but it can also lead to some great shots. Think Tank Photo’s updated rain covers shield your gear from the elements while still allowing easy carrying with its own camera strap supported by the camera lens, not the rain cover alone. The covers have two sleeves for operating the controls and two windows to see both the back and top of the camera. A custom eyepiece allows the cover to seal without impeding the viewfinder, and a front cover keeps rain off the glass in between shots. The Hydrophobia V3.0 comes in five different sizes. The company’s third-generation covers also launch with a new line of emergency covers that are smaller and more compact than ever. The Think Tank Photo Emergency Rain Covers have a single access for hands at the bottom and fewer extras. Both series are available now, with the Hydrophobia starting at $ 115 and the Emergency at $ 35. Sorting through images and designing photo albums is a time-consuming process, but Fujifilm is designing artificial intelligence (A.I.) to help. This week, Fujifilm announced Personalized Select and Personalized Layout. The first selects the best images for you while the second automatically generates album layouts. Fujifilm says that both programs are personalized — as the A.I. gets to know your preferences, it will adapt to making selections and layouts in the future, improving the more you use it. The company says the software is a response to the growth in the number of images taken by digital cameras that makes selecting images and designing albums a tedious process. Fujifilm says the tech will be part of “several products and services” in the spring of 2019. Fujifilm didn’t share exactly what programs the A.I. will be part of, but it’s easy to imagine the technology in an online photo-ordering platform or even integrated into editing software. The ProTactic line of camera bags is one of accessories giant Lowepro’s best sellers — and it just got an upgrade. This week, Lowerpro launched the second-generation ProTactic series, a line of camera and lens bags designed for durability and shock protection with updates for better organization. The series includes two new backpacks, two lens cases, two utility bags, and several accessories. The ProTactic BP 350 AW II fits up to two standard DSLRs with up to eight lenses and a 13-inch laptop, while its bigger sibling, the ProTactic BP 450 AW II fits up to two pro-sized DSLRs, up to eight lenses and a 15-inch laptop. 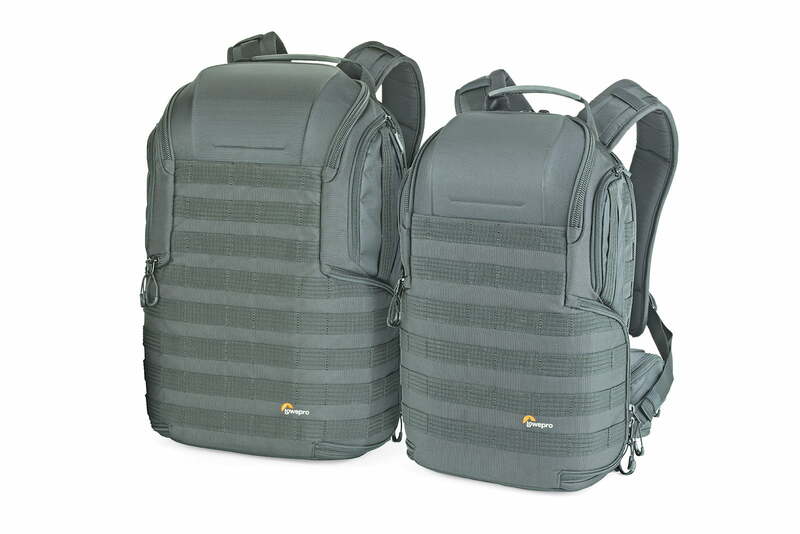 The backpacks also use convertible utility belts and multiple attachment points for adding on storage. The series also includes the ProTatic Lens Exchange 100 AW and 200 AW, the ProTactic Utility Bag 100 AW and 200 AW, and smaller accessories including a bottle pouch, phone pouch, utility belt, and quick straps. The series is already available from Lowepro’s website as well as select retailers, with accessories starting at $ 12 and bags starting at $ 50.